1. Cup pineapples lengthwise into quarters, right through fronds. Remove and discard cores. 2. Scoop out pineapple, leaving shells intact. 3. Core and pare apples. Remove lobsters from shells. 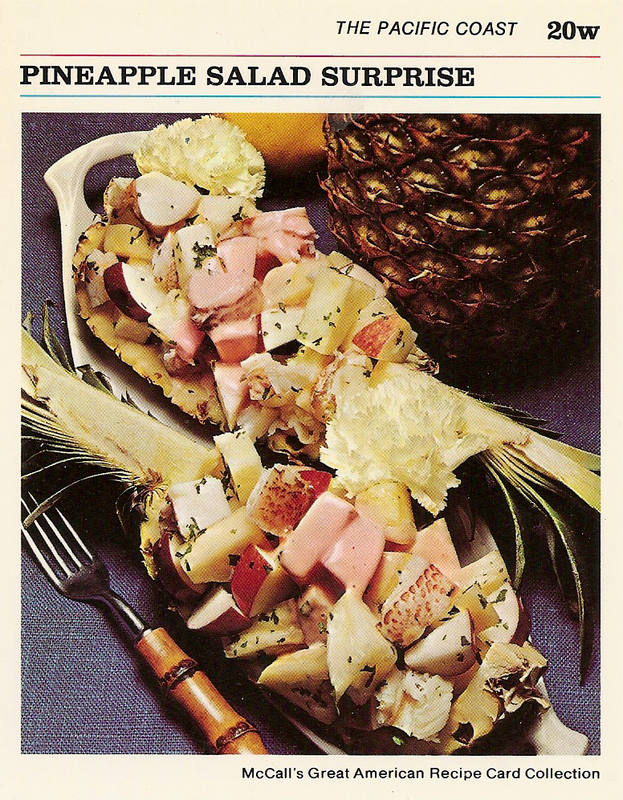 Cut lobster meat, apples, and pineapple into 1-inch cubes. Combine in medium bowl with tarragon and parsley; toss to blend. Refrigerate, covered, several hours, or until well chilled. 4. Make Sauce: In small bowl, combine mayonnaise, catsup, Cointreau, and port; mix well. Refrigerate, covered, until well chilled. 5. To serve, lightly toss lobster-fruit mixture an d sauce to mix well. Divide evenly into pineapple shells. If desired, decorate each with a flower. Wow, I made this for a holiday back in 7th grade. I remember it was good but took more effort than it was worth.